I've been in marathon training mode since December, but unfortunately, have just really been struggling with speed, so I wasn't really sure how this was going to go. I took some time off from any form of speedwork last fall, and am just having trouble getting back into the swing of things. Don't get me wrong, I am running A LOT (I've already put in over 600 miles this year), but the speed I had in the first half of 2015 is just not there. Needless to say, I knew a PR was out of reach (especially since my PR is on a super fast course). Therefore I decided to settle in on a goal to run this at goal marathon pace of 8:00-8:10. Ideally, I also wanted to beat my time from last year of 1:45:43. 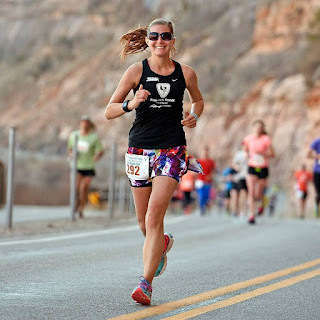 My friend Kellee had a cabin reserved in Moab and offered to let me stay with her, so I drove down on Friday night before the race (as opposed to last year where I drove up the morning of). I got into town a little before 6:00, picked up my packet and then went to meet her and some friends for dinner at the Moab Brewery. After dinner I stopped by City Market to find something for breakfast the next morning (I really should start thinking ahead about these things) and then headed back to our cabin to get everything ready for the next day! The plan on Saturday morning was to meet our friend Stuart at the bus pickup at 7:45, so we got up around 7 and got ready, heading out around 7:30. We found a parking spot and started walking towards the buses. And I realized... I FORGOT MY RACE BIB. Seriously. The one thing you cannot forget at a race, and I forgot it. Luckily, I had driven, so I told her to go ahead and I'd run (drive) back to the cabin and meet up with them later. Thankfully I had plenty of time....but I felt like a serious mess. I drove back, scrambled through my bag, finally found the bib, and then headed back to the race start. By this point, I didn't even try to find a good parking spot and ended up just walking about 3/4 mile or so to the buses before getting on and heading up to the start. Meanwhile...as I'm sitting on the bus, I realized, I also forgot my Garmin. Clearly I was having some issues this morning... I think I've been racing too much - I don't take enough time anymore to make sure I have everything! :) Oh well, I still had my FitBit Surge which does have a GPS on it, so I wasn't super concerned. Once I finally made it up there, I went to go look for Kellee and Stuart on "the rock" (see last years post)....but there was NO ONE sitting on the rocks this year. Apparently sitting on the rocks is no longer allowed (end of an era! )...so I wandered around until finally Kellee spotted me (thank goodness I was wearing my hot pink and coral North Face jacket). We sat on some ground rocks (not the same...seriously you have to have run this before to understand the importance of the rocks!) for hours (literally) until it was finally time to start walking up to the start. I decided to go do a quick warm-up before squeezing my way back into the crowd just before the gun went off. Kellee, myself, and Stuart before the start! I ran into another Skirt Sports Ambassador! My first few miles went well: 8:06, 7:52, 7:54. Despite having a few faster-than-goal-pace miles, I felt good - I was running hard, but not too hard - manageable for a half. There was a slight headwind, but it didn't feel too bad. Unfortunately, the longer I ran, the more the wind seemed to pick up. I ran mile 4 in 8:18. Slower than I wanted, but I figured it was only one mile, I could make up for it. Then Mile 5 was 8:38. Uh-oh. The race curves through a canyon so I kept hoping that we would turn in a new direction that would block the wind. No such luck. My next few miles averaged in the 8:30-8:40 range. Not what I was going for. Meanwhile, while I normally do not think of this race as being all that hilly, the wind made every single uphill feel more uphill than it should. I kept hoping I could pick up my pace. But again, no such luck. Stole this from the Moab Half Marathon website - cool picture of the course! Managed another good race picture this year! Finally, it was time to exit the canyon around mile 11. This did mean a change in directions, and I do think we managed to get out of the wind a little bit, although I was too far gone to really pick up the pace. I finished mile 12 in 8:35 as I turned off the main stretch of road for the last mile before the finish. I tried to pick it up as best as I could and ended up finishing in 1:50:45 - a little over 5 minutes slower than my goal time. I had heard this race could be windy, but the 2 years I had previously done it (2013 and 2015) I was lucky to not have any. The only good thing about the wind was that it kept me from getting too hot like the previous year. I'm not sure what is more hindering: heat or wind? Honestly, they're both pretty tough...at least I didn't have both?! But, despite the wind, it was still a gorgeous day in Moab, and a good training run for my upcoming marathon! FitBit Splits: 8:06, 7:52, 7:54, 8:18, 8:38, 8:32, 8:40, 8:36, 8:22, 8:43, 8:31, 8:35, 8:29. Later that afternoon we went for a hike at Mill Creek Canyon - it was gorgeous although there might have been several unexpected water crossings!